No information on the distribution and status of fishing cats on Java has been collected for more than 20 years. Before investing in labor-intensive, targeted field surveys of fishing cats using cameras, there is first a more general need to accrue evidence supporting the identification of potentially suitable suites for intensive investigation. Interviews and questionnaires have effectively been used to survey, assess local status, and more broadly map the distribution of numerous cryptic carnivore species (Aubry et al. 2006, Jacobson et al. 2013, Kotschwar Logan et al. 2014) and other mammals (Lopez-Arevalo et al. 2011, Meijaard et al. 2011, Ziembicki et al. 2013). We plan to conduct semi-structured interviews based on a standardized questionnaire model to assess recent familiarity with fishing cats and the strength of evidence for their occurrence across seven different regions of western Java defined by Melisch et al. (1996). In order to identify suitable pool of respondents in each area, we will work with community leaders in local human communities (e.g., fishing, agricultural, etc.) to identify a broad pool of candidates among 3 x 3 km spatial grid overlays for each region; each spatial grid represents the approximate home range of a fishing cat as determined by the only study to investigate this aspect of their ecology in detail (Cutter 2015) . Each grid overlaying non-urban habitat at all seven sites will contain a single replicate for that site to be defined as two interviewees selected at random from the a priori pool, two as recommended/selected by community leadership, and two as recommended/selected by the those respondents initially identified by community leadership; these latter two selection approaches are a variation of the respondent-drive sampling design (Heckathorn 1997, Salganik & Heckathorn 2004). A total of six interviewees selected using both methodologies will consist of each replicate for a total of six per grid, which should account for potential variation in local conditions within each grid or replicate (Zeller et al. 2011). Both types of replicates will also facilitate more robust occupancy and predictive distribution modeling frameworks (e.g., Zeller et al. 2011, Lopez-Arevalo et al. 2011), which we will develop as conservation planning tools for subsequent action as a result of our field work. The location of all credible firsthand observations will be marked as to location and searched thoroughly for physical sign and evidence of fishing cat presence whenever access or proximity permits (i.e., sites within grids that permit seasonal access and investigation). This includes either adopting a strategy of using eight compass-heading 100 m transects, or in the case of shorelines, two 400 m transects in each direction. In addition, all secondary records of fishing cats, and recent firsthand records that fall well outside of our pre-defined study regions, will be marked approximately with the help of respondents and flagged for future follow-up should. We will vet the credibility of interviewees and minimize the potential for biased responses by (1) assessing respondent familiarity with both local and non-local fauna using graphic identification cards and a series of validation questions (Zeller et al. 2011), and (2) concealing our true objectives (Jacobson et al. 2013). as to our principal interest (i.e., not explicitly referencing our interest in fishing cats) in favor of one suggesting a broad assessment of human perspectives of local wildlife. Our major hypothesis, albeit possibly counterintuitive, is that local fishing cat populations that exist on Java are likely to found among modified, multi-use habitats and should be very familiar to some local people. Much of the standing tropical forest on Java is gone, but fishing cats have proven adaptable in other human-modified landscapes IF shooting, poisoning, or trapping isn't a widespread threat. Still, a paradoxical challenge unique to the study of critically endangered species is the very low sample size we expect to achieve. Although our surveys are based upon proven, scientifically-rigorous methods, too few valid records could leave us having to adapt our ultimate analytical strategies. 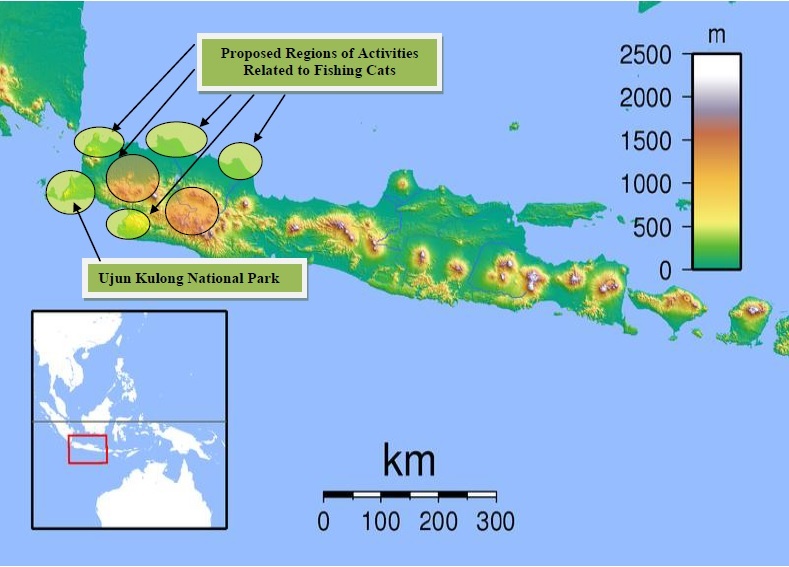 Our current plan is to use respondent records to model the spatial occupancy of fishing cats across an expansive areas. However, an early strategy will be to periodically evaluate and model the relative strength of evidence we obtain from respondents in the context of potentially relevant landscape and anthropogenic variables. This data will be integrated into a dynamic, probabilistic model of suitable remaining habitat for fishing cats, with the results of surveys from each new area potentially informing our priorities while in the field. We will then have the capability to validate model predictions as we progress further along and survey new areas. If we are fortunate enough to identify sufficient physical sign and the records we obtain suggest a high strength of evidence, we can incorporate both into occupancy-based and multiple regression modeling frameworks to thoroughly examine the impact of important habitat factors on fishing cats, including land use type and intensity, water, human population density, human activity, proximity to nature reserves and water, proximity to industry, etc. These models will comprise the scientific basis for our recommendations as to the next steps needed to effect conservation action, as well as more intensive, site-specific research, all of which will comprise the largest major output resulting from these efforts.